By the time producer-director Roy William Neill embarked on the ninth of Universal’s popular Sherlock Holmes B-movie series, the formula was well established: high-grade sleuthing, comic relief and the occasional frisson of chills enough to earn the cross-over for a few sequels into horror territory. The Pearl of Death, based loosely on Conan-Doyle’s short story The Six Napoleons, was no exception. It’s amiable enough but is chiefly only of interest due to an introductory cameo for the intriguing and tragically short-lived actor Rondo Hatton. 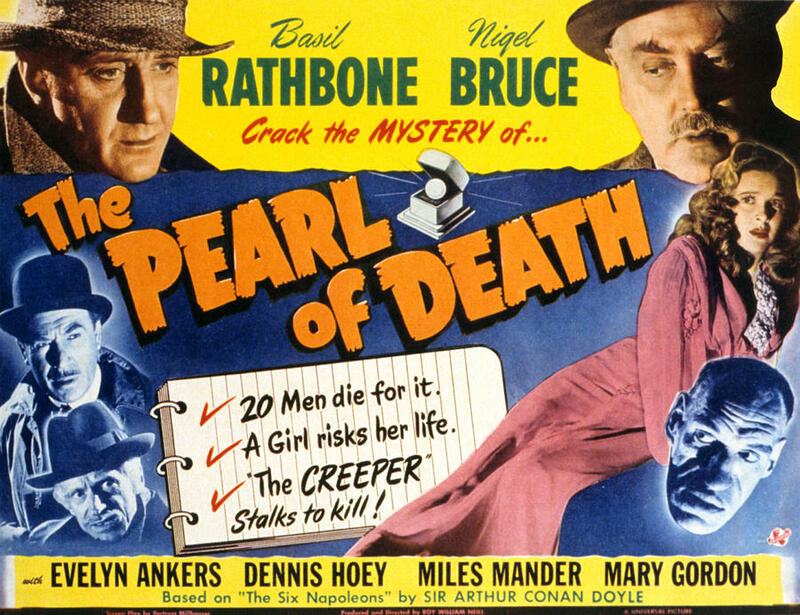 Before we get to him, the main story concerns a series of apparently unconnected murders across London whereby the victims are found with broken backs and surrounded by a litter of smashed crockery – a perfect case for Basil Rathbone’s master sleuth and his faithful sidekick Nigel Bruce. Meanwhile the focus of attention is upon the missing Borgia Pearl, an infamous trinket leaving a trail of death in its wake “with the blood of twenty men upon it down through the centuries”. 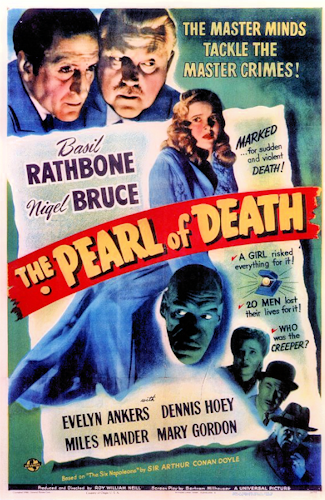 Such is the pearl’s value that out of the woodwork comes the notorious criminal Giles Conover (a suitably caddish Miles Mander) whose own reputation for being behind seemingly every unsolved crime in the nation precedes him. Conover is assisted by beautiful genre regular Evelyn Ankers who had already graced the series in 1942’s The Voice of Terror as well as appearing in the Wolf Man, Frankenstein, Dracula and the Invisible Man fright franchises for the studio (racking up seventeen credits between 1943 – 44 alone). Along for the ride as usual is Dennis Hoey’s bumbling egotist Inspector Lestrade. He and Bruce are responsible for the comedic touches while Holmes feels responsible for the inciting theft of the pearl after he cuts the wiring in the Royal Regent Museum’s lax security system, leaving it exposed for Conover to nab it. The film then becomes an engaging battle between Holmes and his nemesis, both of whom are masters of disguise and don a number of them in order to outwit the other repeatedly across the city in hot pursuit of the deadly jewel. There’s always time though in Bertrand Millhauser’s screenplay (his third for them) to remind us of the close relationship between the great detective and his loyal friend: “My dear Watson, I really must caution you against hitting reporters in the teeth”, advises Holmes genially. connection between the mounting, apparently motiveless killings, we are drip-fed advance word of Conover’s fear-inducing henchman known as the Hoxton Creeper. “’Oxton ‘orror, I call ‘im”, mutters Lestrade helpfully. We are given a couple of teasing, shadow-obscured shots of this figure until in the climactic skirmish there is the first horror film full close-up of him played by Rondo Hatton. Once seen, Hatton is never forgotten and one must be sensitive to his unsightly facial physiognomy as this was sadly no feat of any make-up artist’s work. 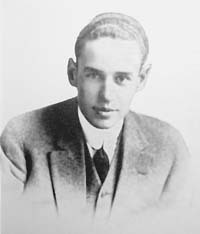 In his youth Hatton was a regular Joe high-school American, born in Maryland in 1912 before moving with his family to Florida. By all accounts he was a popular and attractive athlete before enlisting in the Forces (his Hillsborough High School yearbook photo bears this out). This became a fateful career move as his service in France during WWI saw him exposed like many soldiers to the hideous effects of poison gas in the trenches. Hatton spent some time post-war as a newspaper reporter before moving to Hollywood in 1936. By then he had gradually fallen victim to the devastating physical effects of acromegaly, a condition that causes grotesque enlargement of the bone structure across the head, hands and feet. Whilst this was attributed to the gas attacks, it can also be triggered by a pituitary gland disease that usually occurs only after the subject reaches full adult age, thus roughly coinciding with the timeline of his war injury. In his case it lengthened Hatton’s facial structure and gave him the kind of bulbous nose and excessively fleshy lips that could be confused with a life in the boxing ring as well as filling out his form across the shoulders and extremities. Hatton’s unfortunate disfigurement appears to have been present years before his reporting spell as his unique look was spotted and co-opted by director Henry King to play a Dance Hall Bouncer in Hell Harbor (1930) shot in Hatton’s native Florida. A number of cameos followed until he struck a sort of gold with The Pearl of Death. After Universal quickly slotted him into The Jungle Captive and as ‘Mario the Monster Man’ in (Sherlock Holmes spin-off) The Spider Woman Strikes Back, they realised they could shorten his Pearl of Death nickname to ‘The Creeper’ thus capitalising on his emerging marquee value in a short burst of films built around him. 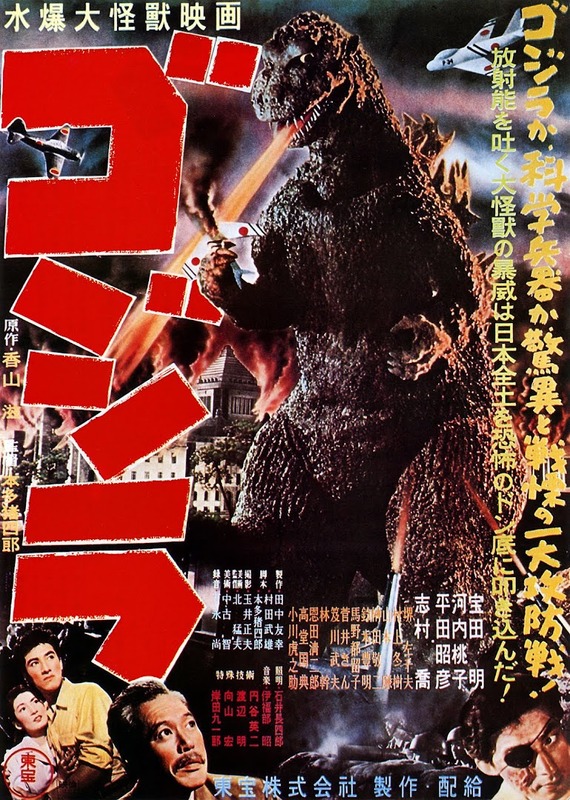 The studio’s bosses were no slouches when it came to sensing a marketing opportunity regardless of insensitivity – remember that they reduced Boris Karloff to just a marketable surname when he achieved his first flush of horror fame with 1931’s Frankenstein, and later would insist on removing the ‘junior’ from Lon Chaney’s son so he could be slyly positioned as a direct replacement for his father. Despite Hatton’s unsettling look, “He was a pleasure to work with - intelligent, sensitive and kind” recalled Jean Yarborough who directed him in the brace of 1946 horror movies House of Horrors and The Brute Man that the actor managed before his untimely death from a heart attack that year. 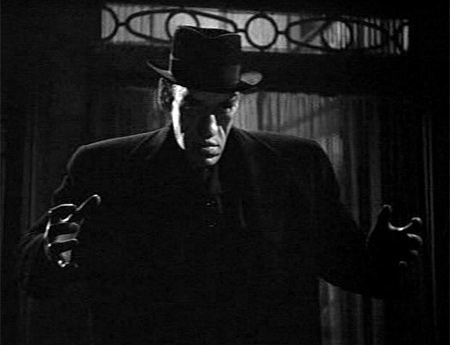 Although these movies might be argued as a form of exploitative employment tantamount to a modern-day carnival freak show, they provided Rondo Hatton with a living and a type of fame in the genre that has outlived him more so than many actors. Aside from frequent name-checking in horror-related material over the decades, his name was posthumously given to the industry’s Rondo Hatton Classic Horror Awards which since 2002 have honoured ‘the best in classic horror research, creativity and film preservation’.